To view a PDF copy of this alert, please click here. 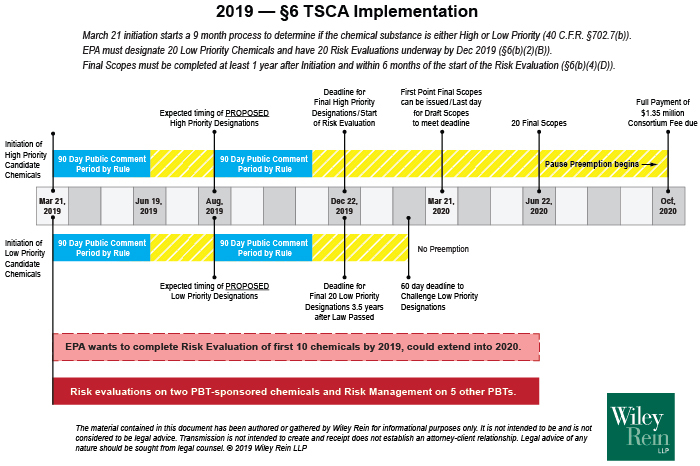 On March 20, 2019, as required by the Frank R. Lautenberg Chemical Safety for the 21st Century Act of 2016, the U.S. Environmental Protection Agency (EPA) announced the first set of 20 “high priority” and 20 “low priority” candidates for prioritization for risk evaluation under section 6 of the Toxic Substances Control Act (TSCA). The announcement of the list is not based on a finding by the EPA of chemical risk. Also, EPA will not officially propose a high or low priority designation for any of these chemicals until later this year. As a practical matter, the March 20, 2019 list is a clear and public statement that EPA believes it is highly likely that these 40 chemicals will be given the designation for which they are being considered—EPA did not list any “spares” to meet the statutory requirement to have 20 chemicals designated in each category by the end of this year. Thus, companies that manufacture or rely on any of the chemicals named on the March 20, 2019 listing (either high or low) urgently need to turn their attention to TSCA and the potential impacts that EPA’s prioritization decisions for these chemicals could have on their businesses. Companies have the next 90 days, until June 19, to submit initial comments on the chemicals on the list. Based on our initial review of the public dockets, more information is needed on these chemicals across the board to ensure a fair, transparent, and reasonable review. Inclusion of a chemical in the March 20 list, however, does not mean that regulation or restriction of any particular use of a named chemical is a fait accompli. Notably, and most importantly, the initiation step precedes EPA’s formal risk evaluation. As a result, it is too early in the process for EPA to have reached any conclusive determinations of risk or safety for a chemical or any given use of the chemical. Primarily, the announcement of this list signals that EPA thinks there are sufficient data for these chemicals to make the designation calls. The March 20 announcement initiated a process that EPA cannot stop. As shown in Figure 1, EPA must review these chemicals and make a prioritization decision within the next nine months. During this period, EPA will screen the toxicity and exposure data for these chemicals and all of the conditions under which they are manufactured, processed, used, and distributed through to their ultimate means of disposal. Per TSCA section 2605(b)(1)(B), a “high priority” chemical is one “that EPA determines, without consideration of costs or other non-risk factors, may present an unreasonable risk of injury to health or the environment because of a potential hazard and a potential route of exposure under the conditions of use....” A low priority chemical designation is based on EPA finding that this definition is not met. Because EPA interprets the statute to require a risk evaluation for the chemical itself, even a single use can be the basis for placing a chemical into a risk evaluation, even if all the other uses are low priority. EPA’s high priority candidate selections are shown in Table 1. In creating the list of 20 “high priority” candidate chemicals, EPA’s selection includes several groups of substances that share similar chemistry or function. EPA has listed each related chemical separately for the purpose of complying with TSCA’s minimum throughput requirement, but it is likely the agency expects—or hopes—some of the analyses will be applicable to more than one chemical. The agency looked exclusively to the TSCA 2014 Updated Work Plan and to chemicals for which it has already performed substantial work. The 2014 Work Plan identifies these 20 chemicals as having moderate to high hazard and exposure potential, with low to moderate potential for persistence and bioaccumulation in the environment. In terms of surprises, EPA’s list does not include most of the chemicals that qualify for preferential selection based on TSCA’s statutory criteria—chemicals on the TSCA Work Plan with the highest scores for persistence and bioaccumulation, human carcinogenicity, and acute and chronic toxicity per section 6(b)(2)(D). EPA also did not identify any metals, any of which score high on the 2014 Work Plan for these characteristics. This may reflect EPA’s continued evaluation of how to comply with the statute’s requirement to apply a different risk assessment methodology to metals than other chemicals. In all, this candidate list may signal that EPA is still in the process of assessing data for many of the top Work Plan chemicals, and the risk evaluation approaches it will use. To the extent that chemicals lack data on either the toxicity or exposure side, companies who make, process and use these chemicals should anticipate that EPA has several tools it can use to call in this information within the next 3 years as it looks to fill those gaps. It is important to note that a “low priority” designation does not mean that a chemical has zero risk; nevertheless, stakeholders should help EPA build on the record of safe use of the candidates to support their designation as comparatively not in need of a full-blown risk evaluation, and spending the considerable resources such an evaluation entails, at this point in time. Recall that fees alone for EPA to conduct a risk evaluation under TSCA are $1.35 million or more. Most of the twenty low priority substances have been internationally reviewed within the past 10 years, and several are closely related. As shown in Table 2, the group includes gluconic acid derivatives widely used in food and pharma applications, propylene glycol derivatives used in polymer manufacturing, other well-known chemistries used in cosmetics and polymer applications, as well as a candidate solvent. Over half of the low priority chemicals were "determined to be "low priority for further work" for human health and the environment" under the OECD SIDS program. 1. D-gluco-Heptonic acid, sodium salt (1:1), (2.xi. )- (CAS No. 31138–65–5), Docket ID number: EPA–HQ–OPPT–2019–0107. 2. D-Gluconic acid (CAS RN 526–95–4), Docket ID number: EPA–HQ–OPPT–2019–0108. 3. D-Gluconic acid, calcium salt (2:1) (CAS No. 299–28–5), Docket ID number: EPA–HQ–OPPT–2019–0109. 4. D-Gluconic acid, .delta.-lactone (CAS RN 90–80–2), Docket ID number: EPA–HQ–OPPT–2019–0110. 5. D-Gluconic acid, potassium salt (1:1) (CAS No. 299–27–4), Docket ID number: EPA–HQ–OPPT–2019–0111. 6. D-Gluconic acid, sodium salt (1:1) (CAS RN 527–07–1), Docket ID number: EPA–HQ–OPPT–2019–0112. 7. Propanol, oxybis- (CAS No. 25265–71–8), Docket ID number: EPA–HQ–OPPT–2019–0124. 8. 2-Propanol, 1,1′-oxybis- (CAS No. 110–98–5) (dipropylene glycol), Docket ID number: EPA–HQ–OPPT–2019–0123. 9. Propanol, [2-(2-butoxymethylethoxy)methylethoxy]-(CAS No. 55934–93–5), Docket ID number: EPA–HQ–OPPT–2019–0118. 10. Propanedioic acid, 1,3-diethyl ester (CAS No. 105–53–3), Docket ID number: EPA–HQ–OPPT–2019–0119. 11. Propanedioic acid, 1,3-dimethyl ester (CAS No. 108–59–8), Docket ID number: EPA–HQ–OPPT–2019–0120. 12. Propanol, 1(or 2)-(2-methoxymethylethoxy)-, acetate (CAS No. 88917–22–0), Docket ID number: EPA–HQ–OPPT–2019–0121. 13. Propanol, [(1-methyl-1,2-ethanediyl)bis(oxy)]bis- (CAS No. 24800–44–0), Docket ID number: EPA–HQ–OPPT–2019–0122. 14. Decanedioic acid, 1,10-dibutyl ester (CAS No. 109–43–3), Docket ID number: EPA–HQ–OPPT–2019–0113. 16. 1-Eicosanol (CAS No. 629–96–9), Docket ID number: EPA–HQ–OPPT–2019–0115. 17. 1,2-Hexanediol (CAS No. 6920–22-5), Docket ID number: EPA–HQ–OPPT-2019–0116. 18. 1-Octadecanol (CAS No. 112–92–5), Docket ID number: EPA–HQ–OPPT–2019–0117. 19. 1-Butanol, 3-methoxy-, 1-acetate (CAS No. 4435–53–4), Docket ID number: EPA–HQ–OPPT–2019–0106. 20. Tetracosane, 2,6,10,15,19,23-hexamethyl- (CAS No. 111–01–3), Docket ID number: EPA–HQ–OPPT–2019–0125. The dockets for the 20 low priority candidates are surprisingly light on information concerning their use and potential for exposure. Companies will want to review the dockets to see what information EPA has and perform their own gap analysis to evaluate whether their uses of these widely-used substances are adequately and accurately described. Some companies will need to engage simply because their commercial interests in the food and cosmetic applications for some of these low priority candidates far outweigh the industrial applications in which they may or may not take part. We think this list is useful, but companies should consider a more targeted approach to comment on the issues that affect you the most and that you understand best. In particular, if you have exposure and use data, providing it to EPA will go a long way to ensure that agency prioritization calls have the proper context and are based on real-world conditions. If you think that your use of a high priority candidate meets the safety standard or does not present an unreasonable risk, you should explain those uses clearly to establish they do not make the chemical a “high priority.” Conversely, companies with uses that EPA needs to concern itself with should weigh all of their options carefully. As your company begins to study this list, it is important to remember that EPA can’t make a “no priority” decision or postpone a prioritization decision because it discovers that more data are needed. By law, EPA must designate each of the 40 chemicals as either a “high priority” or “low priority.” This does not mean you cannot disagree with EPA’s initiation of a chemical, or the prioritization pathway EPA has initiated for the chemical, and you should not hesitate to say so. In addition, however, you should plan to provide an explanation and/or an analysis of your desired outcome in light of your concerns. Consider whether your preferred approach allows EPA to continue to meet the statute’s required objectives and how effective your comments are compared with EPA’s planned approach. EPA will look for sound science and reasoning in the comments they receive in response to their announcement of these first prioritization candidates. On or before June 19, stakeholders should be providing EPA with substantive information and offering their expert opinions on the uses of these chemicals. Companies often consider this kind of information as highly proprietary. This factor need not be a drawback for submitting comments, because specific manufacturing, processing and use information is protected under section 14 of TSCA as confidential business information (CBI) and does not require extensive justification for the claim. Now that the list is out, it seems like the right time for associations and manufacturers to assess their supply chains and engage with companies who are processing and using these chemicals in their products. The cooperation and support from processors and downstream users of these listed chemicals will be critical for helping EPA reach accurate and reasonable determinations on the need for extended risk evaluations. It will be extremely valuable for companies downstream to be ready to offer their own assessment of exposures for their uses. Exposure information can be developed in a number of different ways over the next several months. For example, companies may want to assess how well EPA’s consumer product model captures the actual use of a company’s product, or they may seek to engage third party consultants to conduct industrial hygiene monitoring in the workplace to help EPA understand how well exposures are being controlled. 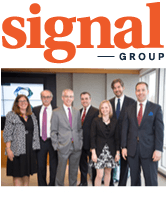 Simply offering EPA a realistic description of how a chemical is being used will be valuable information for the agency, who may have no other way to readily obtain the kind of detailed information that companies can provide. Under the new TSCA, the burden lies on companies, not EPA, to demonstrate safety. In the absence of information, EPA has no choice but to undertake a lengthy risk evaluation.